Presented here is a wonderful little Pennsylvania domed top chest in Windsor Green Paint. 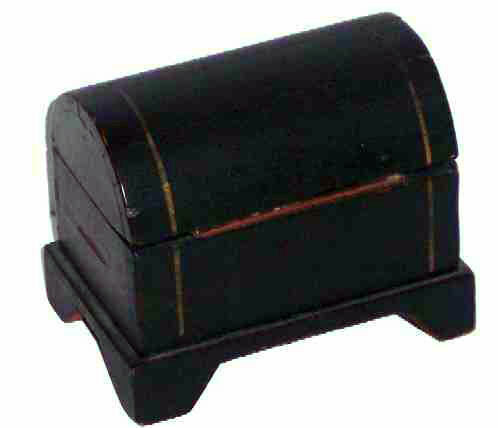 These little chests were copied from the full sized ones and built just like the larger ones. It is a mere 4-1/4" long (bracket base) 3-1/3" high and 2-3/4" wide (measured at the bracket base). The chest is slightly smaller and sits on the base. Wooden pegs fasten the chest. A single brass hinge with hand cut screws attaches the top to the chest. The inside is lined with newspaper dated 1858. Overall the paint is in wonderful condition, nice and dry, just the way we like it. There is some loss on each of the sides and in the front there is wear at the keyhole from age and usage. It is obvious that the key was turned in the lock many times over the years. The only decoration on the chest is the yellow pinstriping. Simple, yet effective. 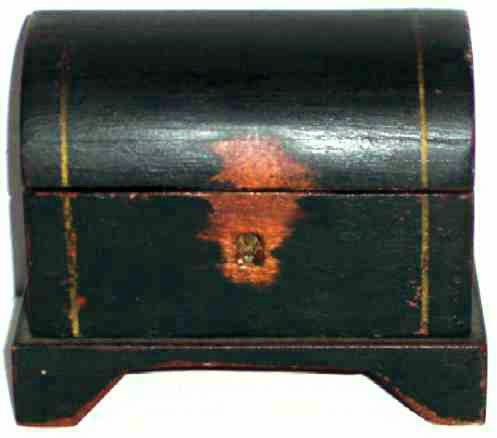 The piece was most likely made to be used as a trinket box for the storage of valuables as indicated by the lock to keep prying eyes away.